It’s a new year, and with it come changes. With resolutions come a lot of internal changes that don’t produce an immediate or visible change, but one thing that we can change to enhance our lifestyle is our interior decor. The experts are predicting a big shift from the past trends including out with minimalism and in with maximalism. The horror! Anyway, since our living room is as much the heart of the home as is the kitchen I wanted to focus on the big living room trends for 2018 as predicted by the experts. Let’s begin! I’ve been coveting a luscious velvet sofa for quite some time now, but with the minimalist look being in full effect I’ve been holding out. 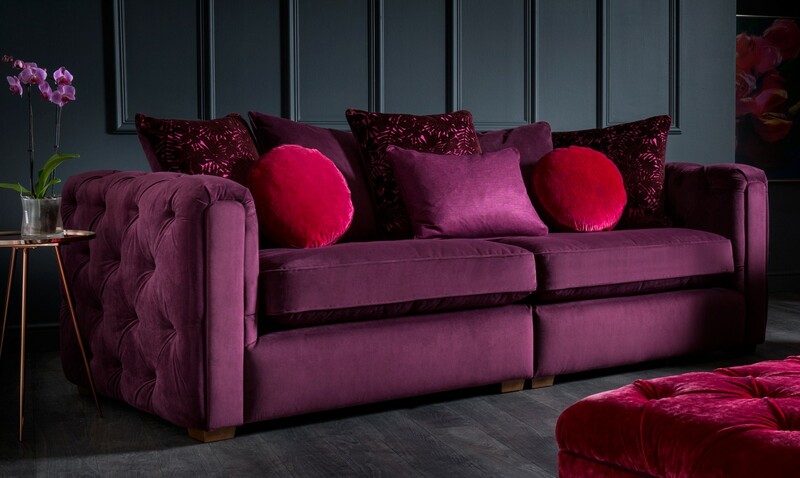 Now that the experts are predicting a shift towards a more luxe look a stunning sofa like this one would be the perfect addition to my home. Who said that you can’t have a clutter-free aesthetic and still indulge in a more luxurious living space? Marie Kondo. the creator of the KonMari organising method thinks everything in our home should bring us joy, and this sofa certainly would bring lots of it! The Scandinavian design craze that has been welcome into most British homes is hygge, and it’s all about cosiness and comfort. Hygge hasn’t lost any of its popularity, on the contrary, it’s still gaining traction and set to be one of the big interior trends of 2018. Hygge, which is Danish for that mood of cosiness and comfort is set to keep on keeping on with its popularity. 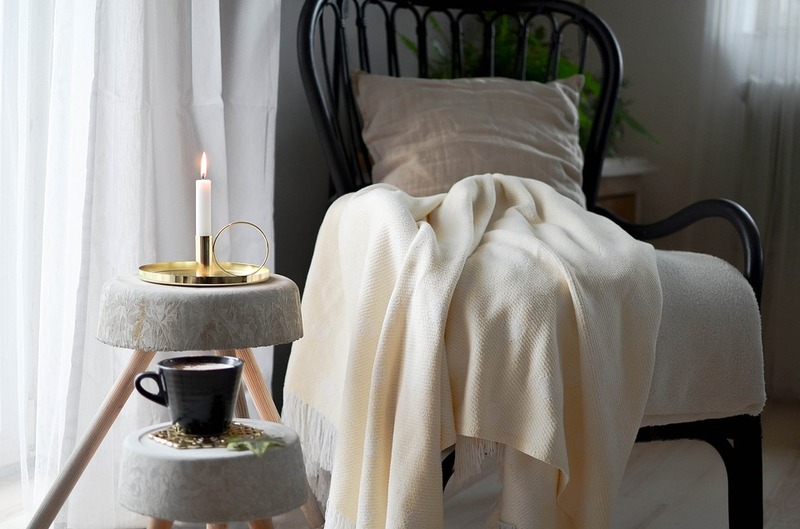 Think throw blankets, soft fabrics, cushions, and everything that brings cosiness and comfort to your living room and you’re right on point with the hygge lifestyle. Cooler shades have been all the rage in the interiors world, but the shift is being made to all things warm. Think rich camels and rust colours. Any colour that brings that warmth into your living space is set to be popular this year. Greys haven’t been fully edged out but the focus is more on warm greys that complement the warmer colours that we are sure to see flooding our Instagram feed. 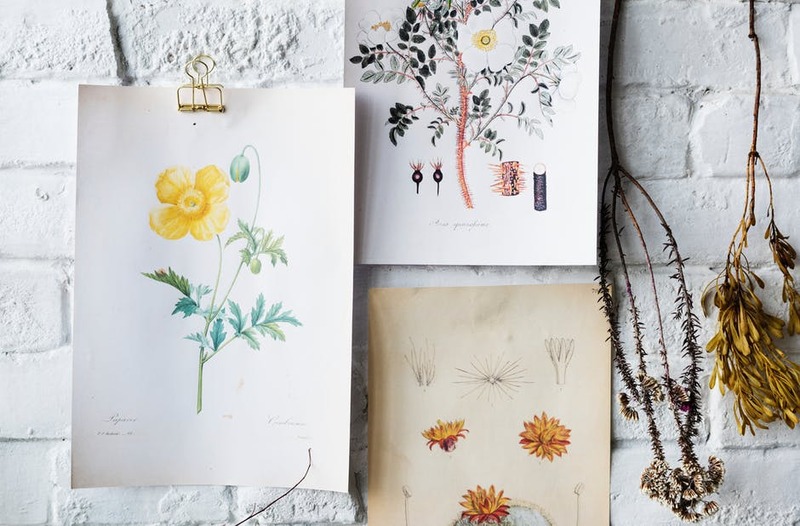 The palm print has been very popular for the past few years, but the botanical print trend will now steer towards including flower prints. Big floral patterns are set to give your living room a warmer and more homely feel which pairs up perfectly with the colours that are set to be a hit. Ultimately it’s up to you, as I always say. Interior decor is all about making your mark in your home ensuring that you give it that personal touch. They say that people don’t remember what you say, but how you make them feel. I really think that a living room can represent that too. It’s all about making our guests feel a certain way and about us feeling that way in our space too.